Delivering a frictionless customer experience is at the heart of everything we do at Percepta. Across each solution that we deliver, we endeavor to focus on driving customer satisfaction and exceeding Client expectations. We have a philosophy – Brilliant Basics, Magic Touches – which ensures we get the fundamental basics of delivering a customer operation right, while going the extra mile to wow and dazzle our Clients’ customers. Our Centers of Excellence – Customer Relationship Centers (CRCs) – are dedicated to managing customer inquiries and concerns across multiple channels, in multiple languages, until a resolution has been achieved. 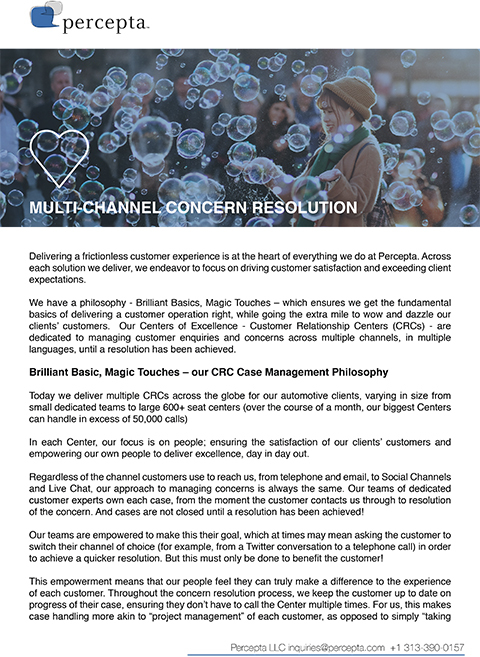 Today we deliver multiple CRCs across the globe for our automotive Clients, varying in size from small dedicated teams to large 600+ seat centers (over the course of a month, our Centers can handle in excess of 50,000 calls). In each Center, our focus is on people; ensuring the satisfaction of our Clients’ customers and empowering our own people to deliver excellence, day in, day out. Regardless of the channel that customers use to reach us, from telephone and email, to Social Channels and Live Chat, our approach to managing concerns is always the same. Our teams of dedicated customer experts own each case, from the moment the customer contacts us, through to resolution of the concern. And cases are not closed until a resolution has been achieved! Our teams are empowered to make this their goal, which at times may mean asking the customer to switch their channel of choice (for example, from a Twitter conversation to a telephone call) in order to achieve a quicker resolution. But this must only be done to benefit the customer! This empowerment means that our people feel they can truly make a difference to the experience of each customer. Throughout the concern resolution process, we keep the customer up to date on progress of their case, ensuring they don’t have to call the Center multiple times. For us, this makes case handling more akin to “project management” of each customer, as opposed to simply “taking a call”. The best possible outcome is a happy customer; one who receives a frictionless experience from the brand. To truly understand the impact of each Center, we feel that a combination of “Voice of Process” and “Voice of Customer” metrics should be used. Voice of Process (VoP) metrics are globally recognized contact center measures, from Average Handle Time (AHT) to Aged Case Analysis, which we use to highlight the overall operational performance of each CRC. For example, Aged Case Analysis, which highlights cases unresolved or “open” over a certain period of time, can help us to identify possible roadblocks in our ability to resolve concerns. Yet while VoP metrics help us to measure and track day to day operations, the inclusion of Voice of Customer (VoC) metrics provides a much fuller picture of our Client’s business. Across each of our Centers, our VoC metrics focus on Customer Satisfaction (CSAT) and ensuring each concern and customer case is resolved. This information helps us to understand the impact we have on the customers we serve and deliver a truly frictionless customer experience. We believe our Case Management Philosophy and the value we place on key customer metrics is unique. Because of our Brilliant Basics, Magic Touches philosophies, our Clients’ see us as an invaluable part of their business.